Stock Returns – How can we help? Sometimes you may need to return stock to its supplier if it has been delivered faulty, over supplied or if it is on consignment. With Vend's stock returns feature you are able to do this by navigating to Products -> Stock Control and clicking 'Return Stock’. By creating a stock return you will be generating a record of this return in your store as well as sending an email of the return to your supplier(s) which can act as a credit request. Important: It is vital that inventory is not returned for the above reasons via an inventory count. This is because an inventory count does not provide the correct record of what was returned, when and who it was returned to. Once you've head to Products -> Stock Control and clicked on Return Stock you will be taken to the stock return details screen. On this screen you'll be able to specify the name of the return, the supplier you are sending it to and the outlet the products are being returned from. Name/Reference: Here you’ll name the return and put in any reference information for yourself or your supplier. Deliver to: For this field, select the supplier you wish to return the stock to. Return from: Pick the outlet where the stock is being returned from. Due Date: You can put in a date here if you have an estimated time when the stock will be returned to the supplier. Return No. : An automatically generated number that allows you to keep track your return. You can use this as your reference when contacting the supplier or search for this number from the stock control page if you need to quickly find the return at a later date. Supplier Invoice: When you first ordered this stock, your supplier may have included an invoice number. If you like, you can input this here for your supplier's reference. After you have filled out all the details, click 'Save'. This will take you to the 'Edit Stock Return' screen. Here you will be able to add the stock you wish to return to the supplier and specify the quantities. Once you are happy with how this looks click 'Save'. You'll now be on the open stock return screen. Here you can edit the list of products involved in this stock return, edit the details of the stock return and send it to the supplier(s). When you’ve confirmed the stock return is correct and you're ready to send it off to the supplier(s), click ‘Send Return’. 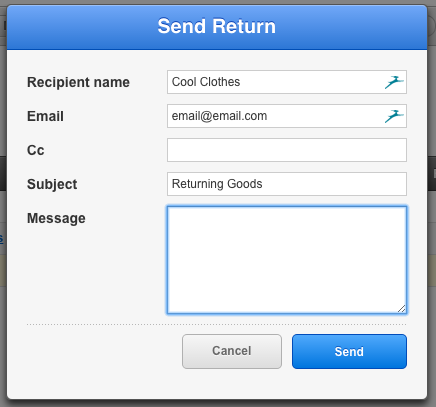 This will open up the Send Return window where you can add the name of the supplier, their email address as well as a message and subject line. The return will now be marked as sent and delivered to the supplier’s email. Upon sending the stock return, inventory levels and inventory values will immediately be deducted from your store for the products involved in the return. Tip: You can use your list of sent stock returns to keep track of all your stock returns and make it easier to follow up on any outstanding or overdue credits.